Written not as a complete life story but as a series of vignettes, Wolterstorff's memoir moves from his humble beginnings in a tiny Minnesota village to his education at Calvin College and Harvard University, to his career of teaching philosophy and writing books, to the experiences that prompted some of his writing-particularly his witnessing South African apartheid and Palestinian oppression firsthand. In This World of Wonders is the story of a thoughtful and grateful Christian whose life has been shaped by many loves-love of philosophy, love of family, love of art and architecture, love of nature and gardening, and more. It's a lovely, wonderful story. 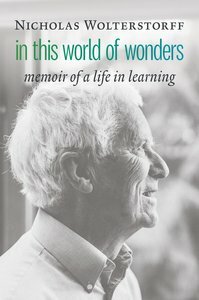 About "In This World of Wonders: Memoir of a Life in Learning"
Nicholas Wolterstorff (Ph.D., Harvard University) is Noah Porter Emeritus Professor of Philosophical Theology at Yale Divinity School, previously he taught for thirty years at his alma mater, Calvin College. He is the author of a number of significant books amongst many Reason within the Bounds of Religion; Art in Action; Until Justice and Peace Embrace; Lament for a Son; Divine Discourse and Thomas Reid and the Story of Epistemology.